Adjustable Tote Dolly. Unique design is adjustable in both width and length for use with different size totes. Easy to adjust by loosening the screws and sliding each side in or out. 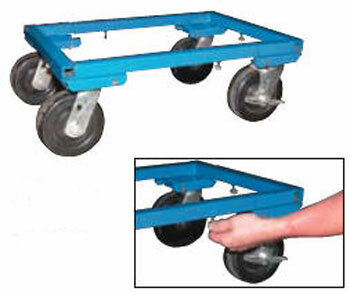 Each unit includes four swivel casters (one with brake) that are attached with caster pads. Overall size is 3" greater than the usable size. Welded steel construction for maximum strength with powder coat blue finish. Totes sold separately.Specs: minimum usable size 16" x 22"; maximum usable size 24" x 34"; capacity 2,000 and 3,000 lbs. Available with 4" or 6" phenolic casters.